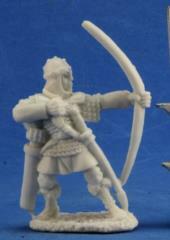 Reaper Miniatures Bones material is a polymer plastic. It is light-weight and slightly flexible, and is very durable. You can paint a Bones figure straight out of the package, and that paint job will also be pretty durable. Bones figures are as detailed as metal figures, for a much lower cost.